It pays to be part of the wolfpack when you play wolfpack pays. Enter the wild and forage for sustenance and free spins when you join the pack of carnivorous wolves. This 5 reel online casino slot game has a slight Native American vibe amount it and you must match up dice symbols that are inked with various animals to create the perfect payline and claim a cash reward. NextGen were founded almost two decades ago and pride themselves on their original and creative development team that continue to come up with innovative and extraordinary game design choices. They deliver unique and high-quality products to guarantee their audience entertaining and engaging gameplay experiences. With a wide range of different themes there is a game for everyone in their repertoire. NextGen is very popular amongst their audience and have become one of the market leaders. Wolfpack Pays has a mesmerizing arty style and will draw you into the scenery easily. You are invited to watch a beautiful wild and rocky landscape on a slightly cloudy day. Everything is set in the gorgeous orangey light of a sunrise and you can see a forest in the distance. There are many wild animals to discover and the most feared is the wolf. The reels in this game are transparent so you can keep watching the beautiful view throughout the entire spins. On the 5 reels and 3 rows you will find two theme related symbols which is a proud eagle and a silhouette of a wolf howling at the moon. The remaining symbols are the classic playing card suits diamonds, clubs, hearts and spades which are all represented like precious gems glowing in different colours. To make this game unique it offers a very creative bonus feature. The Wolf pack on a roll feature is triggered when you land a winning combination. 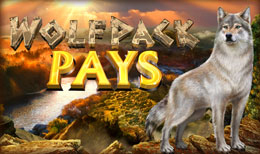 You will now get an additional wild on the reels represented by the wolf pack leader and a free spin. For every consecutive win you are awarded with an extra wild and a further fee spin. If you manage to get four wins in a row you will trigger the free spins feature. In this feature you will get free spins until you have landed three non winning spins at which point you are taken back to the base game. The number of non-winning spins in the free spins period is marked by wolf paws above the reels. Throughout the entire free spins feature you will have five wilds added to the reels. There are 243 paylines in this game making the chances to get a winning combination and triggering the wolf pack on a roll feature very high. To be part of the beautiful scenery and get to know the wolf pack you have to bet a minimum of 40p or up to 80 pounds. If you want to add an extra risk factor to the game you can also activate the gamble feature after a win by clicking the “hearts/clubs” button below the reels. All you have to do in this feature is to guess correctly the colour or suit of the next card drawn. If you guess right you will double or quadruple you win, if you guess wrong you lose your winnings of this round. Wolfpack Pays has a stunning art-style which will immerse you quickly into the theme. The symbols on the reels are just as beautiful as the gorgeous landscape in the background. There is not much of a variety in bonus features but the one bonus it does have is pretty unique and enriches the gameplay experience. Wolfpack Pays has an amazing game feel with nice chances of making your spin very profitable. Want to try another slot game? Read more and play Beowulf.